We had a fun situation last night. How will tonight’s compare? This is one of the tighter games in recent memory, with Phil leapfrogging Chris into second on the penultimate clue. The scores are so close that the wagering calculations are very easy. If Phil doubles his score, he’ll have 23,600. To cover this all-in wager, Holly will need to wager 11,700. An incorrect response with that wager will leave Holly with 200. To stay above her total, Phil can wager up to 11,600. Chris can wager up to 10,600. A successful doubling will put Chris at 21,600. To cover this, Phil should wager at least 9,800. Holly would need to wager at least 9,700, but this would put her at risk against Phil. 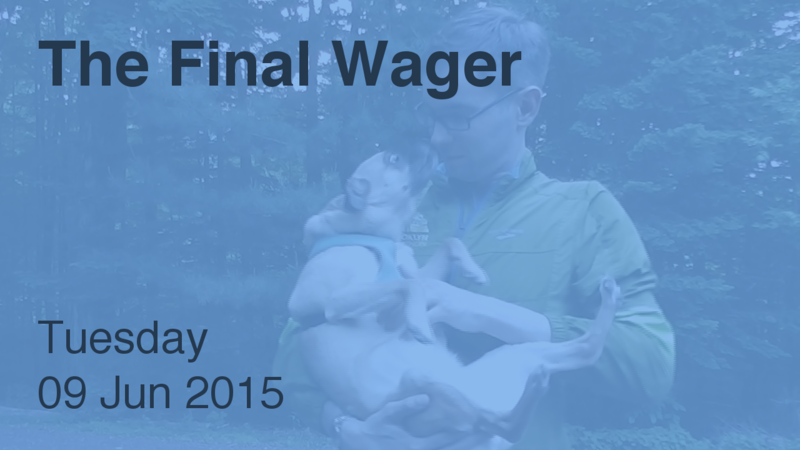 If Phil is incorrect with that wager, Chris can wager up to 8,800 to stay above his total. We can further cap Chris at 8,600 just in case Holly aims to cover him. Because everyone’s so bunched up, there is very little room for mind games. Well, color me confused by these wagers. The gentlemen’s wagers fall to the minimum proper bet of the next player up. And 6,000? There’s no wagering website that will agree with that.